The DN Gold Cup World Championship has been called complete. Congratulations to Poland’s Karol Jablonski for winning an impressive 11th world championship, to Tim Sugar for his win the Silver (B) fleet, and to Chad Coberly for his win in the (C) Bronze fleet. 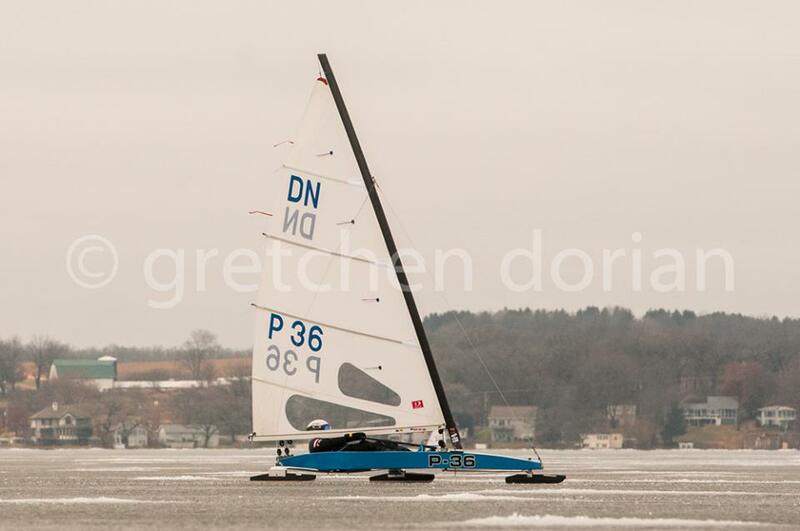 All races will be governed by the Racing Rules of the National Iceboat Authority, the Bylaws of the IDNIYRA as stated in the sections IDNIYRA Regattas, Racing Rules, the DN Official Specifications, the Notice of Race, including any amendments to the NOR,(except as any of these are altered by the sailing instructions) and the Sailing instructions. 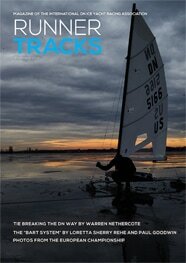 Races shall be sailed under the rules of the National Iceboat Authority and those of the IDNIYRA. Each Regatta will attempt to sail 7 scheduled races per fleet. There shall be two or three fleets depending on the number of competitors and sailing conditions. After 5 races are completed, the points for each yachts poorest race (including DNS, DNF and DSQ) will be eliminated from Scoring. The protest committee may, at its discretion, award a score of DNE to a disqualified yacht that has been found to have dangerously violated NIA Rules Part IV, Sailing Rules, and this race shall not be eliminated from scoring. The next worse score shall be eliminated. In accordance with NIA Rules V.B.3 and Appendix V.B.5, the protest committee may award a prejudiced yacht scoring points in a race rather than ordering a resail. All courses will be a WINDWARD / LEEWARD Inline course with Darling Marks. A diagram of the race course will be posted on the Official Notice Board and a copy for each skipper will be available at registration. All races will be 3 Laps. All DN class yachts meeting the requirements of the DN official specifications and whose skippers meet the requirements of the bylaws of the IDNIYRA as stated in sections IDNIYRA Regattas are eligible to enter and race in the championships. All participants shall provide proof of $300,000 personal liability at time of Registration. The primary site is in the North American Western Lakes Region. Site and Headquarters information will be posted on the DN America Forums. The Entry fee shall be paid in U.S. Dollars. The entry fee is $150.00 if paid on or after January 1, 2017. The entry fee for a junior skipper (under 25 years of age is $100.00. The entry fee is $100.00 if paid by December 31, 2016. The entry fee for a junior skipper (under 25 years of age) is $75.00. The entry fee is $80.00 (USD) if paid by December 31, 2016. The entry fee for a junior skipper (under 25 years of age) is $50.00. The entry fee is $120.00 (USD) if paid on or after January 1, 2017. The entry fee for a junior skipper (under 25 years of age) is $75.00. Novice DN skippers may enter the Regatta with the payment of two years association dues. No other event registration payments shall apply. years. A Novice must comply with all other entry requirements. European Entries are not subject to a late fee penalty. European competitors are requested to notify the race chairman that they will be attending. All skippers are required to complete a Safety Test as part of registration. December 31, 2016: Registration Deadline for early entry fee. Registration- Gold Cup: January 21, 2017, 6:00 pm To 9:00 pm local time: REGISTRATION and CHECK IN in at headquarters listed on the IDNIYRA website. Late phone check in registration information to be listed on the IDNIYRA website. January 22, 2017 first race at time stated in sailing instructions. January 28, 2017 racing is concluded. PRIZES shall be awarded at race headquarters after the regatta is completed. A. Prizes shall be awarded for First thru Tenth place in each fleet, plus the Top Senior, Top Woman, Top Junior and Top Novice.